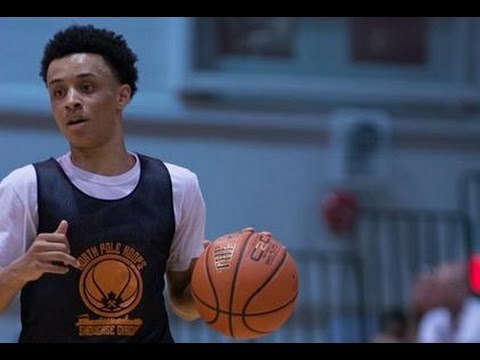 Jaelin Llewellyn’s recruitment has spiked since arriving at Virginia Episcopal School. Schools such as Kentucky, UCONN, Tennessee, Harvard, Oklahoma and Wake Forest, among many others, have taken notice of the 2018 Canadian point guard. Llewellyn has taken charge and is playing with a confidence that has continued to rise along with his recruitment. On this particular play below, he rose above and around a seven footer before dunking the ball. His bunnies and body are transforming into an elite NCAA prospects athletic and physical make up. The opportunity in Virginia has also opened up an opportunity to play with one of Americas most well known AAU Teams in Andrew Wiggins’ sponsored squad Team Loaded who plays on the Adidas Uprising Circuit in the summer. As the lead guard with creative control in the offense Llewellyn is one of the best facilitators around. His scoring ability and feel for the game further add to his stock. For the first time in his young career he has catapulted from a mental stand. Most close to him would say, that not even he was fully aware of his long term potential. In the past he stayed quiet when something bothered him, he was kind to everyone around him. This year there is more of a mean streak on the hardwood. He is just scratching the surface and recognizing the degree to which he can impact a game. He has had many strong games this season at Virginia Episcopal with multiple 20+ point games and high assist numbers. There is foresight of Llewellyn picking up a few more offers over the next few weeks from schools that were tracking him at the end of 2016.